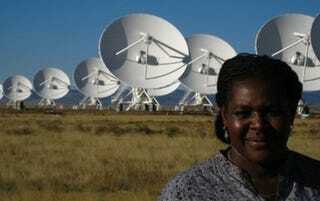 Maggie Aderin-Pocock is an advocate for astronomy. It is a diamond in the sky! This Sunday coming, one of the longest running television shows in the world celebrates 60 yeas of probing the universe beyond our humble globe. For six decades The Sky at Night has encouraged viewers to turn their gaze upwards and take notice of the stars above. It made a national (global?) icon out of the late Sir Patrick Moore who shared his enthusiasm for astronomy with the British public. He presented the first episode on 24 April, 1957 and discussed the discovery of Comet Arend-Roland which had first been spotted in November 1956. The first episode followed Show Band Parade on BBC One (and only at the time) and became a monthly fixture in the schedules. Leading astronomers joined Moore on screen to elaborate on latest discoveries in astronomy and space technology as we moved into the Space Age. Fred Hoyle, Carl Sagan, Arthur C Clarke, Jocelyn Bell Burnell, Sir Martin Rees, Sir Bernard Lovell and Harlow Shapley were all guests on the programme. Through the Space Race, Moore would be joined by astronauts such as Neil Armstrong, Buzz Aldrin, Eugene Cernan, and Piers Sellers. Celebrity enthusiasts such as Queen guitarist Brian May and impersonator Jon Culshaw have also made appearances. There were early attempts at live stargazing events, often hampered by the whims of British weather. But such is life! Chris Lintott and Maggie Aderin-Pocock at Greenwich Observatory. Moore’s final episode was a posthumous broadcast in 2013. Since then The Sky at Night as been presented by Professor Chris Lintott (his team at Oxford were involved in research that sparked speculation about alien super structures last year, though he has a more sober perspective on the subject than many headlines) and space scientist and researcher Maggie Aderin-Pocock, MBE. They are joined by Peter Lawrence who offers tips for the home astronomer and Dr Lucie Green. Recent episodes have included segments by Neil de Grasse Tyson. The International Astronomical Union celebrated the 50th anniversary of the show by naming an asteroid 57424 Caelumnoctu, referencing the first broadcast date and the name being Latin for “The Sky at Night”. Sunday’s edition of The Sky at Night on BBC 4 promises to take a peek at how our knowledge of the Universe has changed since the original broadcast. As ever, it will open with a burst of At The Castle Gate composed by Jan Sibelius.